In the 2018 "Top Doctors" listing, 329 Emory physicians are recognized in the publication. A significant number of physicians recognized in the 2018 “Top Doctors” issue of Atlanta magazine are Emory physicians who practice at one of more than 200 Emory Healthcare provider locations, or who are on the faculty at Emory University School of Medicine. The July issue can be found on magazine stands across metro Atlanta on Monday, June 25. Emory Healthcare physicians, Emory Healthcare Network private physicians, Emory University School of Medicine faculty and Emory medical staff physicians represent 42 percent of the “Top Doctors” included in this year’s list, with 329 Emory physicians out of 780 earning recognition in the publication. That’s more than any other health system in Atlanta. To compile the annual "Top Doctors" list, Castle Connolly uses a survey and research process involving tens of thousands of top doctors across America and the medical leadership of leading hospitals. Atlanta magazine’s "Top Doctors" are selected after peer nomination, extensive research, careful review and screening by Castle Connolly's doctor-directed research team. 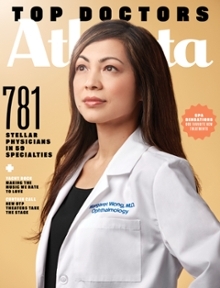 The magazine uses the research by Castle Connolly to provide detailed information about education, training and special expertise of Atlanta doctors. Doctors do not and cannot pay to be selected and profiled as Castle Connolly "Top Doctors."